Megadeth founder Dave Mustaine is sharing details of the band’s upcoming Boot Camp weekend that will see fans join the group on his private estate in Fallbrook, CA from March 10 - 13. 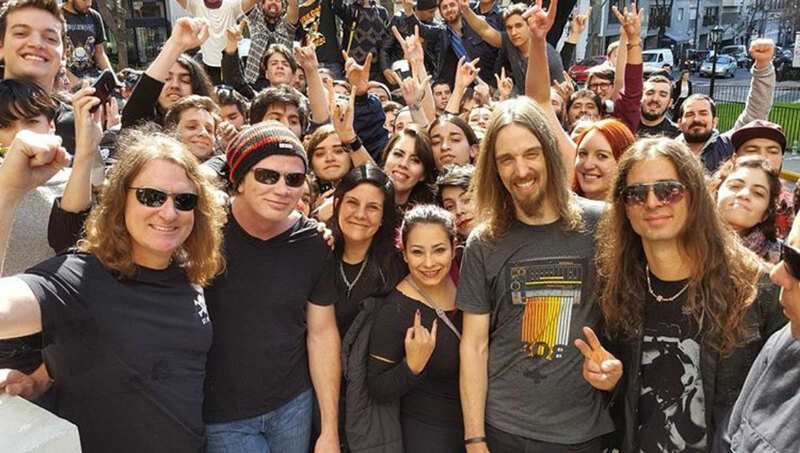 Megadeth Boot Camp will feature an acoustic performance by the band along with fireside stories from the road; guitar, bass and drum lessons, and a jam session; an off-site wine tasting with Mustaine, and more. "It's gonna be at my estate in California,” Mustaine tells Q104.3 New York's Jonathan Clarke. “I still have my home in California. I live in Tennessee full time now, but I still [have a home] in California. It has a vineyard on it, it's got a river running through it, a two-hundred-year-old oak-tree-farm kind of area — real neat. And we're gonna invite all the fans. They come the first night. We kind of get to know everybody, and then we'll have dinner and have a wine tasting. 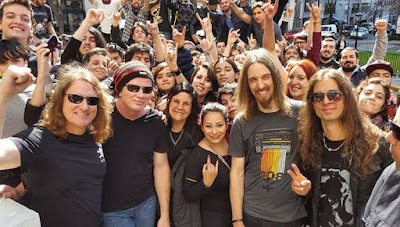 “Saturday morning,” continues Mustaine, “(bassist) David Ellefson – as a guy that's got twenty-five years in a twelve-step program – is gonna do a meditational program that morning. And then Sunday, since he's pastor – some people would question that – he's gonna be doing a little non-denominational church service for us on Sunday morning. And then we're gonna do some more clinics and stuff like that. “And Saturday night, we're gonna have like a s'mores party, and we're gonna sit around storytelling and stuff like that. And then Sunday, before we leave, we're gonna try and get all two hundred people to play 'Symphony Of Destruction' together and have this two-hundred-person army of acoustic guitars playing. 'Cause I figure somebody out of that two hundred is gonna know how to play it right, and they'll drown out the ones that don't." Megadeth will compete next month for hardware at the 59th annual Grammy Awards. The band are nominated in the Best Metal Performance category for the title track to their fifteenth album, “Dystopia”, which will go up against tracks by Baroness ("Shock Me"), Gojira ("Silvera"), Korn ("Rotting in Vain") and Periphery ("The Price Is Wrong"). The 59th annual Grammy Awards will be held on February 12, 2017 at Staples Center in Los Angeles and broadcast on CBS at 8 p.m. ET.